Made in a variety of naturally coloured clays and sizes. 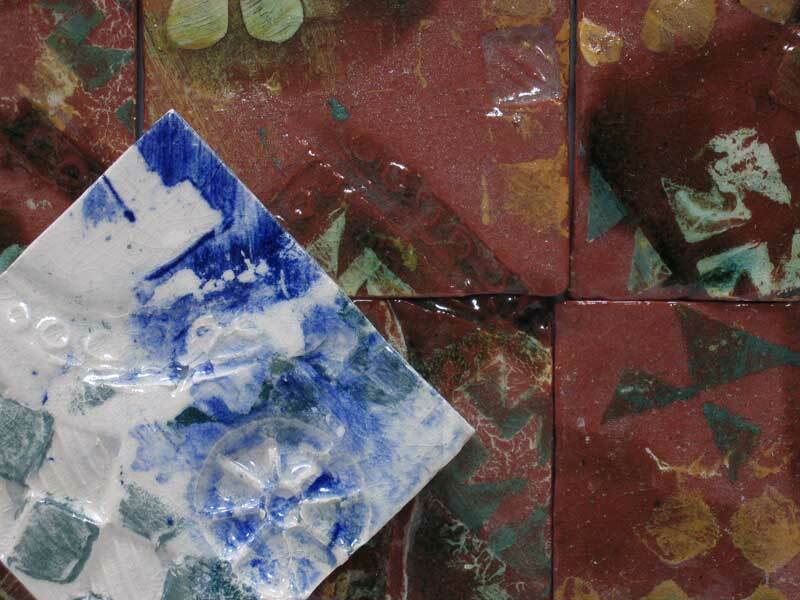 Handmade clay tiles can be decorated using roulettes and plaster stamps, or sponges with coloured clay slips and stencils in a random way, to produce a range of pattern, textures and colours. 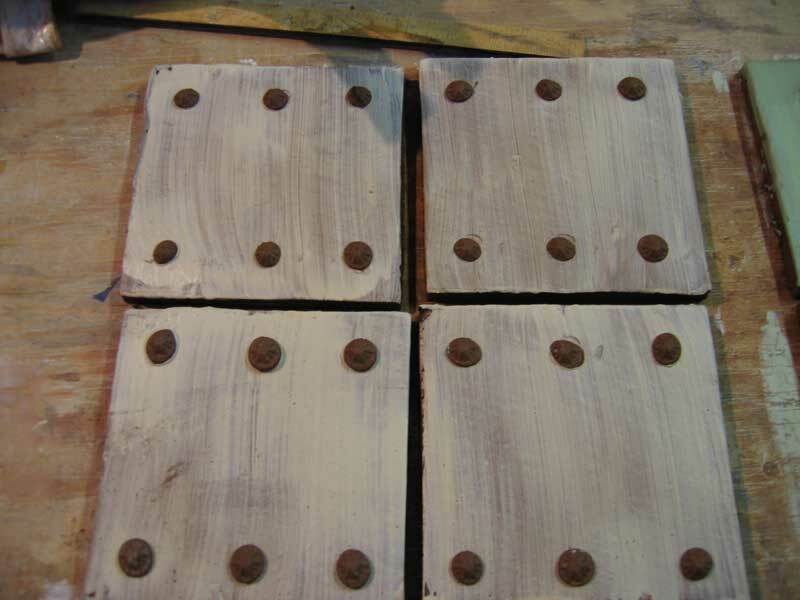 Mould with hand made clay tiles at different stages of making. 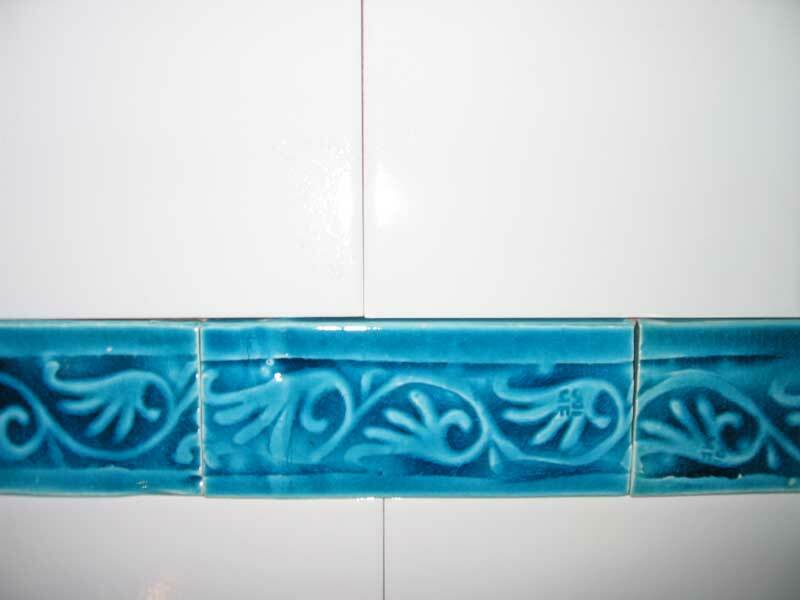 These hand made wall tiles are slowly dried out over several weeks to prevent cracking. The size shrinks as they dry so sizes are approximate only. Max. practical size is 6″. 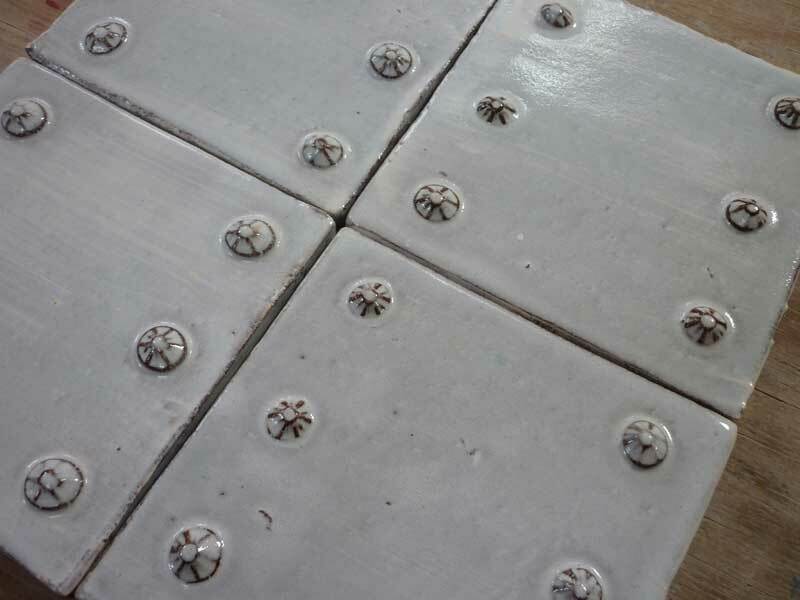 The ceramic tiles are fired for the first time then they can be further decorated with cuerda seca and /or glaze as wanted and refired, or simply treated with a tile sealant for a matt finish. 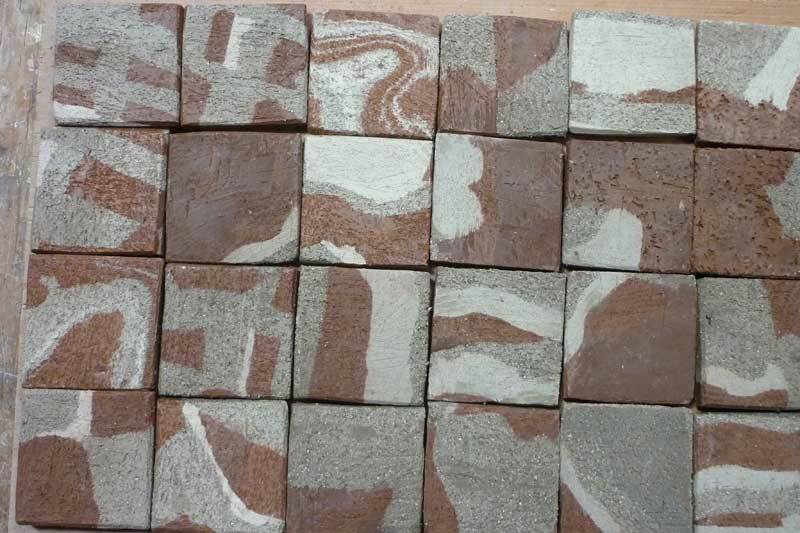 As low-fired earthenware they are best used on internal walls in the U.K. With these handmade tiles the emphasis is on the qualities of hand making to produce variety in texture pattern and colour. No two of these hand made tiles will be the same and characteristics will further vary from bath to batch, so please order enough at any one time for the whole job! 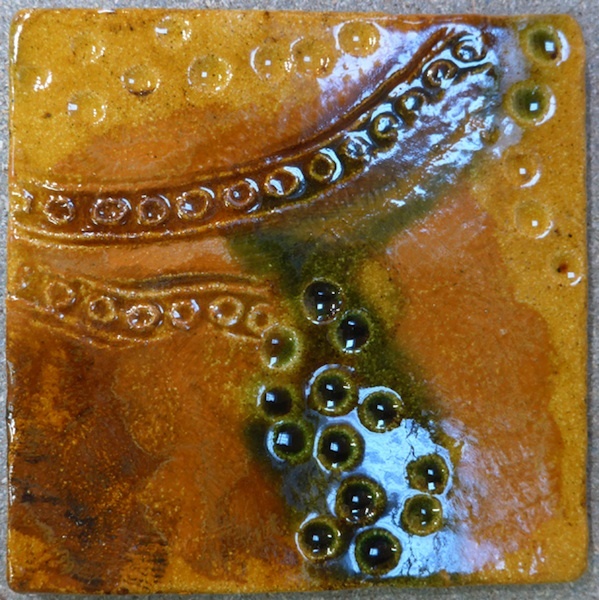 Tiles made with different clays stamped and decorated with coloured slips and glazed with a clear glaze. 10 cm. 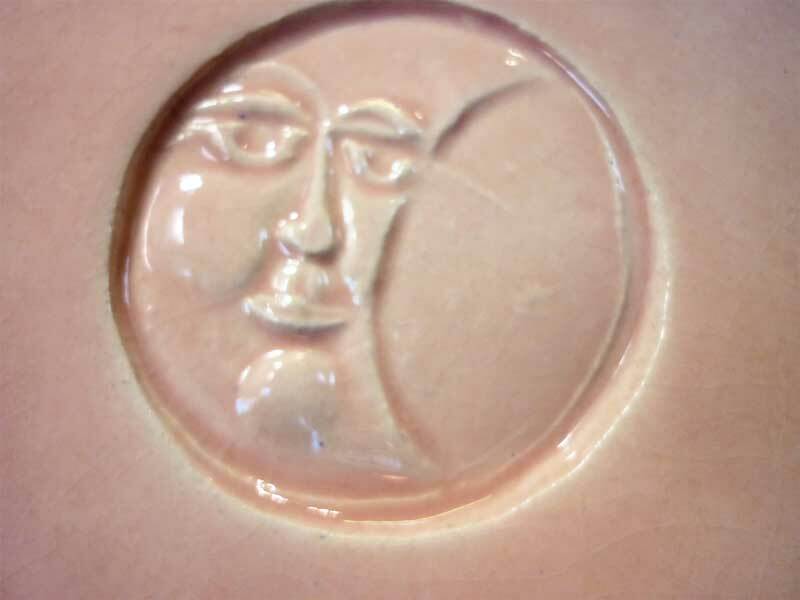 4″ approx. tiles. 10cm. 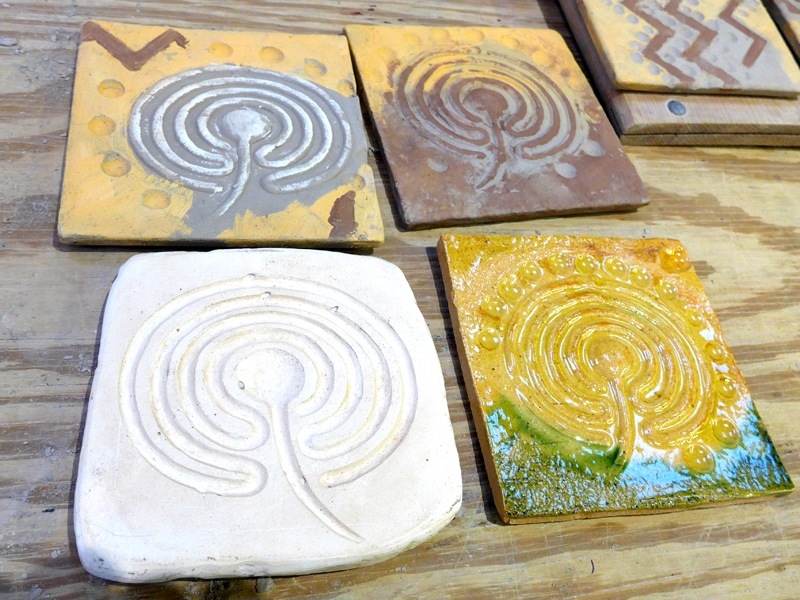 4″ stamped tiles with rouletted border drying before firing. 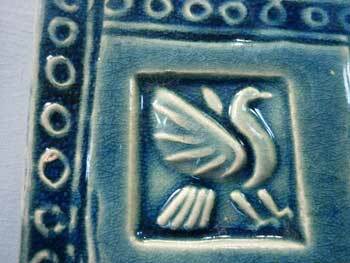 Close up of stamped rouletted tile after glaze firing.10cm. 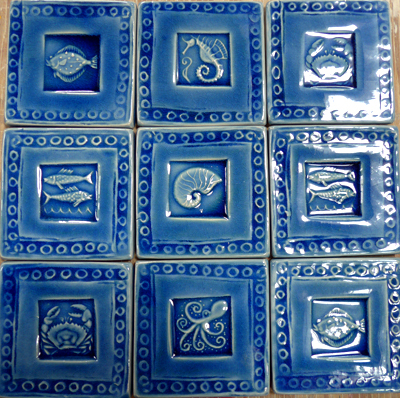 4″ tile. 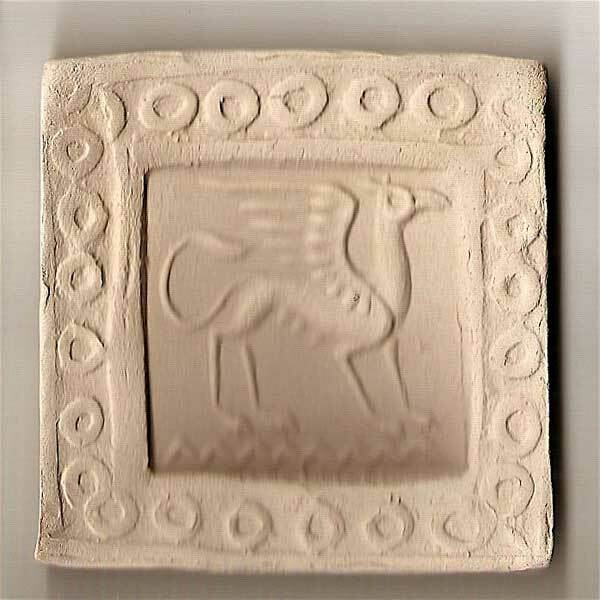 clay tile with rouletted and stamped decoration and several glazes. 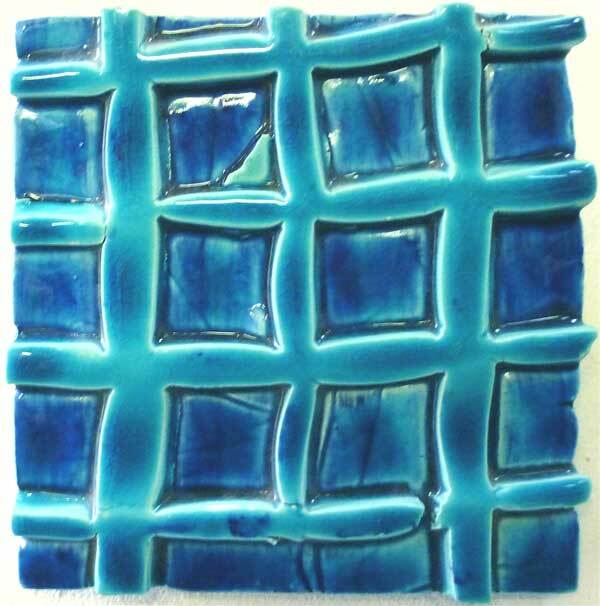 Turquoise copper glaze over blue tile. This pattern will vary from tile to tile. 15cm. 6″ approx. tile. 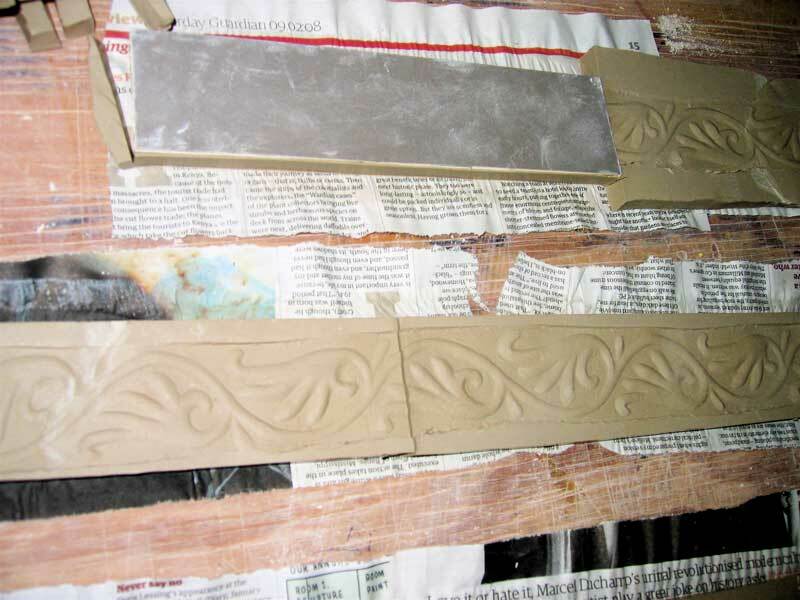 Clay border tiles being cut, then decorated by rouletting. 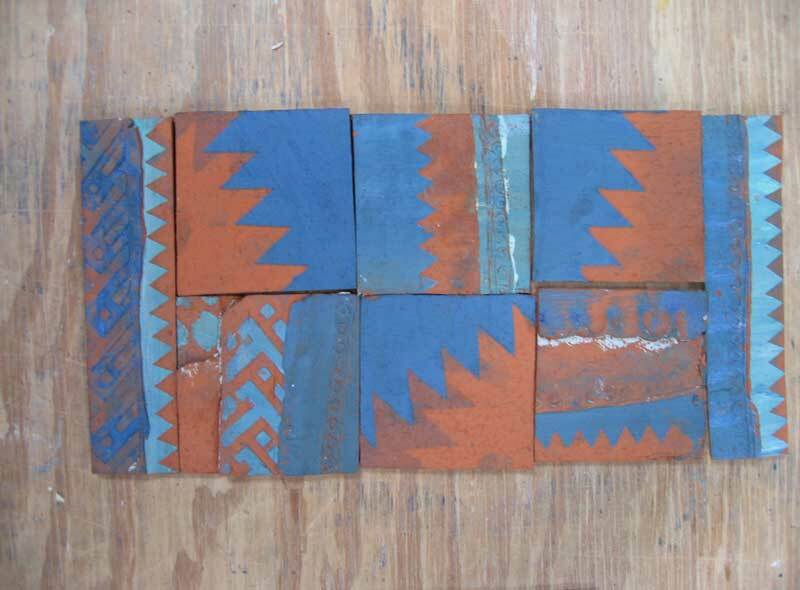 Handmade clay tiles- rouletted borders in different patterns and widths. Fired with a crackle turquoise copper glaze. Red clay tiles decorated . with stencilled coloured slips. Unglazed. 10cm. 4″ approx. + borders. Red clay tiles decorated with added rosettes and white slip, drying out. 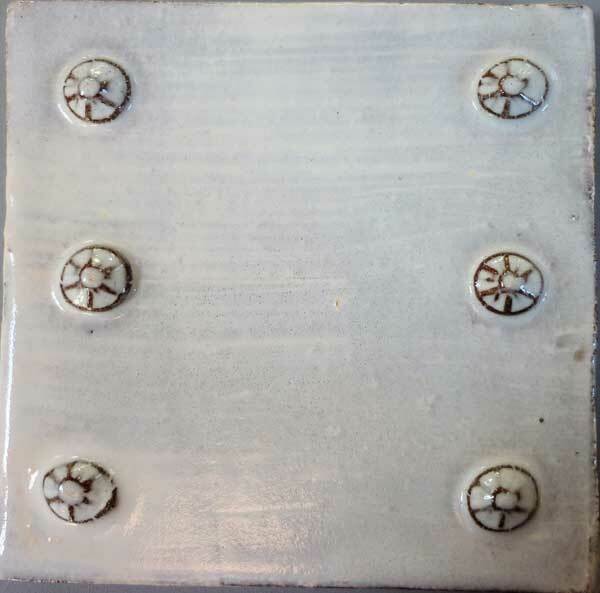 White glazed rosette 15cm 6″ approx.decorated tiles. White glazed red clay tiles. Raised applied rosette decoration . 15cm. 6″ approx. tile. 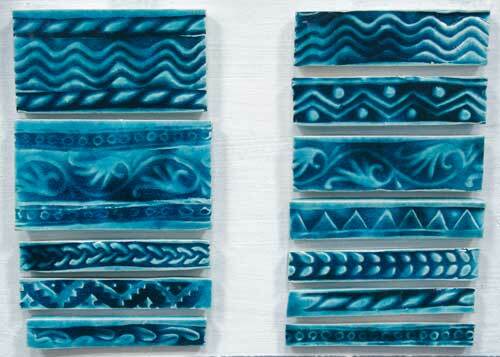 Agateware [mixed clays] splashback tiles after glaze firing. 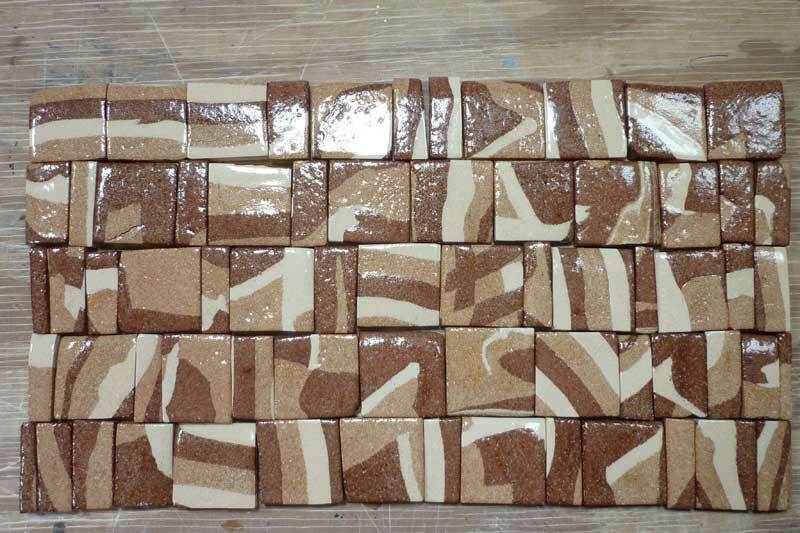 Tile mosaic mixed sizes. 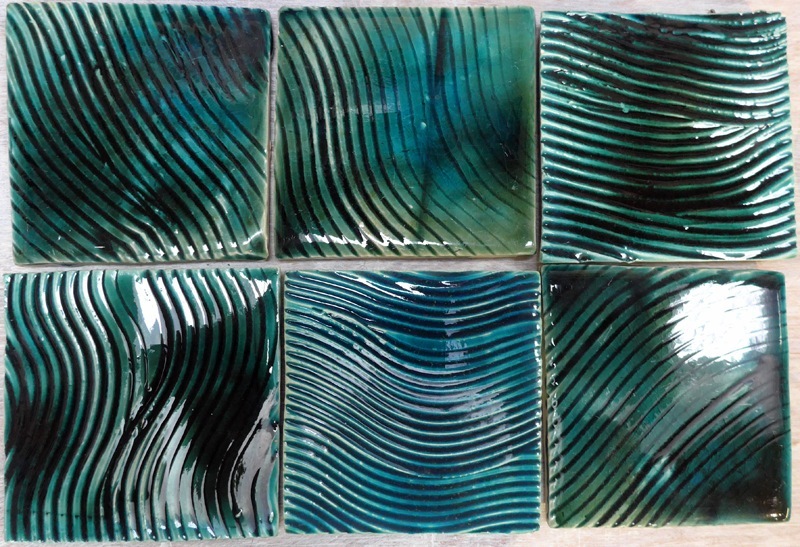 Tiles 5cm. 2″ max. 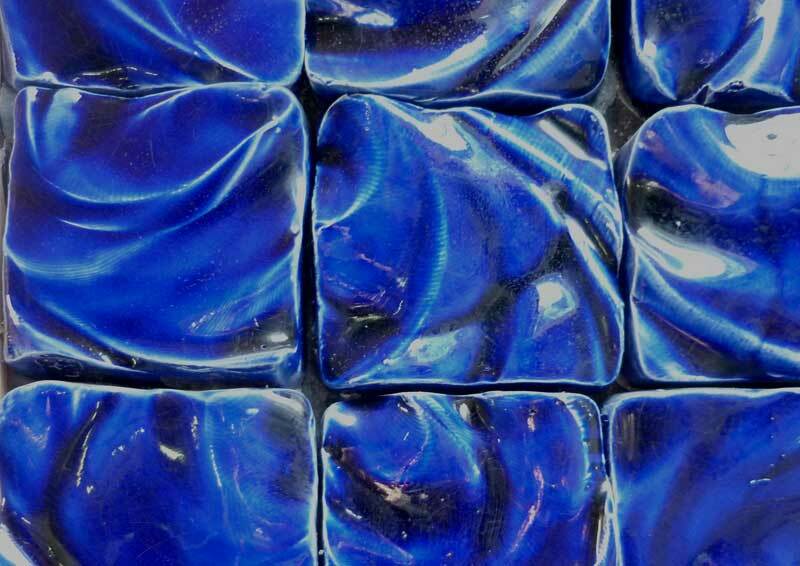 Agate ware tiles [ 5cm. 2″].Different coloured clays are made into a block which is sliced up, then cut into tiles and the surface of each tiles is scraped back.